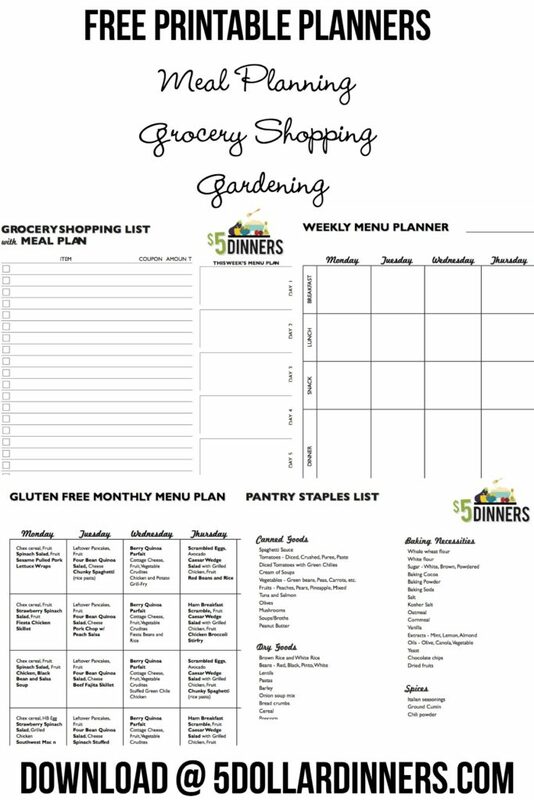 We are now offering our free printable planners through the $5 Dinners Store. They are completely free to download! If your link expires, then you can simply ‘re-order’ it and download it then. Please note that you have 72 hours to download the files. Also, please enter a current email address when checking out, as that is where the files will be delivered. Write you grocery list right next to your meal plan…and keep track of your estimated and actual spending as well. Make your shopping list with the printable template divided into the most common product categories. Make out a month long plan for your menus based on what you have stocked up in your freezer, pantry and fridge. Write up your weekly meal plan for breakfast, lunch, snacks and dinner. Print out a calendar with a month’s worth of gluten free recipes and meal ideas, each with “clickable” links back to the original recipes. Get the accompanying shopping lists for the gluten free monthly meal plan in the same download. Stock your pantry with the items on this list and you’ll be minutes away from the Pantry Staples Meals. The Recipe Cards for the 10 winning Pantry Staples Recipes come in the download as well. Container Gardening Worksheet – Includes space for large, medium, small and rectangular pots. Enough space to include plant name, plant date and number of plants per pot; plus a notes area. Simply add to your cart and check out. They really are free! When this camp up on my facebook feed I almost cried a little! I have been trying to design one. Last night I got frustrated and thought I will do it tomorrow! And here it is! LOVE!!!! Just printed off a grocery list with meal planner. This will help us out a bunch. Thanks! I printed the weekly menu planner and it says “Monthly” menu planner on it. Still says Monthly for the weekly meal planner when I print it out. love the menu and shopping list planner. are you going to develop an app for android? Thank you so much!! These planners are great! Yea! A pantry list that is simple but vital. LOVE THIS. THanks! I just saw your site for the first time today. I printed the shopping list for myself and my daughter too. I also sent her the web site too. I love this website!!! I have recently started meal planning and I am not very good at it yet and this site helps me so much!! It all seems a little overwhelming but I went to your coupon class today and you ladies helped me feel like I can really do this. Thank you so much. My kids and husband will definitely appreciate it! I’d like to Goal Setting sheet. How do I find it? On some of your recipes you use alot of spices that we can not have can make recipes not so spicy. Wow! thanks for the forms. My life is a form. I love the one for planning meals based on what you have. Thanks a Million! Shopping at online grocery stores will enable you the convenience that you require while allowing you more time to do other things in your life that was formerly taken up with grocery shopping. This is really helping me become more organized with my grocery shopping and cooking. Thanks! this web site’s post to be updated on a regular basis. It carries nice stuff. I love your site . I print out a lot of things. through the walkie-talkie, or to close down radio. as Harry Winston, Richemont, LVMH and Bulgari. Rubies are very prominent in Asia for their powers to aid health and happiness. I just found this website/blog, and Wow am I impressed. Thank you for the great ideas, tips, recepies that you have compiled here! You have made my job (mom) so much easier. You have taken a lot of the thought and worry over “what will I make tonight!!? ?” scenario. So THANK YOU!!! I will for sure be passing this along to my friends and family!! Just found this site through Pintrest. Just what I’ve been looking for. Thanks so much. I came across your site while searching for budget friendly and food allergy friendly meals. 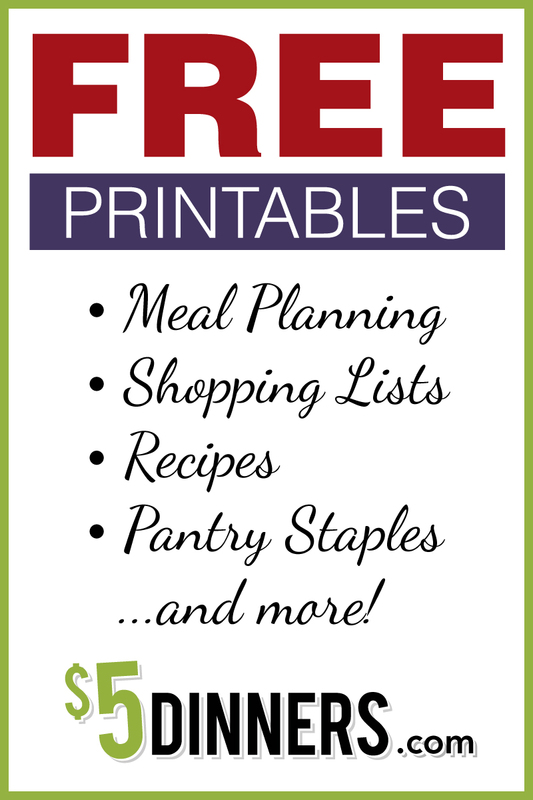 I love the variety of Gluten Free recipes you have, as well as the monthly planner and good list. This is a really great site! I love it! I am very new to this site but really like what I am seeing so far. Would love to see an app that brings this all together in a mobile manner? I just purchased 3 printables 5 dollar dinners and noticed that neither of these 3 had the prep and assembly instruction sheets like the first time I purchased these planners a month or so ago. Do you no longer offer the food prep instruction sheet anymore?